Mushrooms grow on decaying organic matter such as roots, twigs, and construction debris. They are the fruiting bodies of normally occurring soil fungi that usually appear in damp weather. 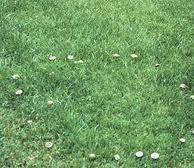 Mushrooms do not damage the lawn, however their appearance is considered unsightly to many. At present there is no chemical control for mushrooms. If desired, mushrooms or toadstools can be removed by mechanical means such as mowing or raking. Take heart, the appearance of mushrooms is temporary and in no way spells disaster for our beloved lawns. Fairy rings appear in early spring and summer. These are circular or arc shaped rings of grass that are darker green than surrounding areas of lawn and may grow faster than surrounding areas. Mushrooms are often a part of the fairy ring picture. As a rule, a stump or some other organic structure is located in the soil directly beneath the fairy ring. The release of nitrogen from the decaying organic material causes the fairy ring. In some instances nitrogen release and fungal growth may be so great that moisture becomes unavailable to grass roots killing grass in the center of the fairy ring. There is no chemical control for fairy ring at this time. Fertilizer may be used to mask the symptoms of fairy ring.